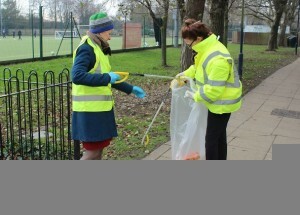 Nviro teamed up with Chichester College to support its ‘Respect the Environment’ week – a campaign to help improve litter at the college and raise awareness of landfill issues. As a prestigious institution and ‘Outstanding College’ rated by Ofsted, Chichester College is justly proud of its reputation and beautiful campus located in the heart of Chichester. Following feedback from staff and student forums who were frustrated by litter and people smoking in undesignated places, the College had the great idea to organise a ‘Respect the Environment’ week to collect all rubbish over a five-day period. 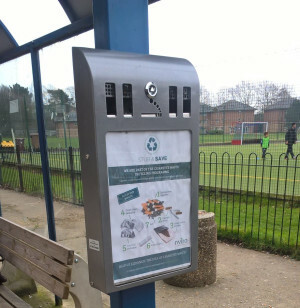 The goal of the campaign was to encourage students to respect the college and take responsibility for looking after it and the wider environment, reinforcing the importance of recycling and disposing of litter appropriately. Nviro has been providing a safe, clean and hygienic environment at the college for the last 18 years. True to our ethos of ‘Cleaning with a Conscience’ and our commitment to continuous improvement, we supported the college in its mission to reduce the amount of rubbish in the grounds, as well as promoting recycling within the college. Everyone at the college got behind the idea and fully supported the campaign. Throughout the entire week, large teams of students and staff, including college Principal, Shelagh Legrave OBE, braved the cold to go out on ‘RESPECT’ patrols. They picked up litter, challenged those smoking in undesignated places and encouraged students to recycle their cigarette butts. Placing the 20 bags of rubbish gathered at the entrance to the college created a visual eyesore, clearly illustrating how much waste is generated across the college over a short space of time. To further highlight and raise awareness of landfill and environmental issues, students and staff also held events in the canteen. This included getting people to identify their carbon footprint as well as games and quizzes to help people understand what can and cannot be recycled. Through our established partnership with waste environmental management company, TerraCycle, Nviro has introduced a recycling system for cigarette waste which has previously been deemed non-recyclable. The system not only helps to eliminate the idea of cigarette waste, but also turns it into something useful. Waste collected through the Cigarette Waste Recycling Programme is recycled into a variety of useful plastic products, such as outdoor construction site hoardings and lumber. Any remaining tobacco or paper is composted – nothing goes to landfill! 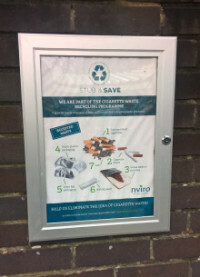 We also provided a poster campaign to gain student and staff buy in, as well as providing new smoking waste receptacles for smoking areas.